There’s a new building in town, going up on the waterfront, and I’m sure you’ve all seen it by now. 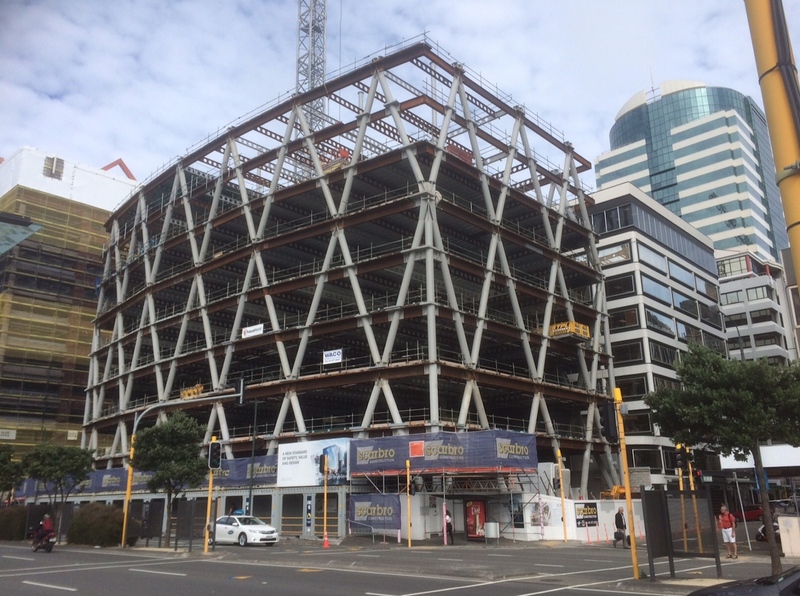 The 20 Customhouse Quay project (code named XXCQ) is already proving to be the most interesting building in Wellington, and technologically, perhaps the most advanced structural solution for a high rise in the whole country. It certainly has me intrigued. 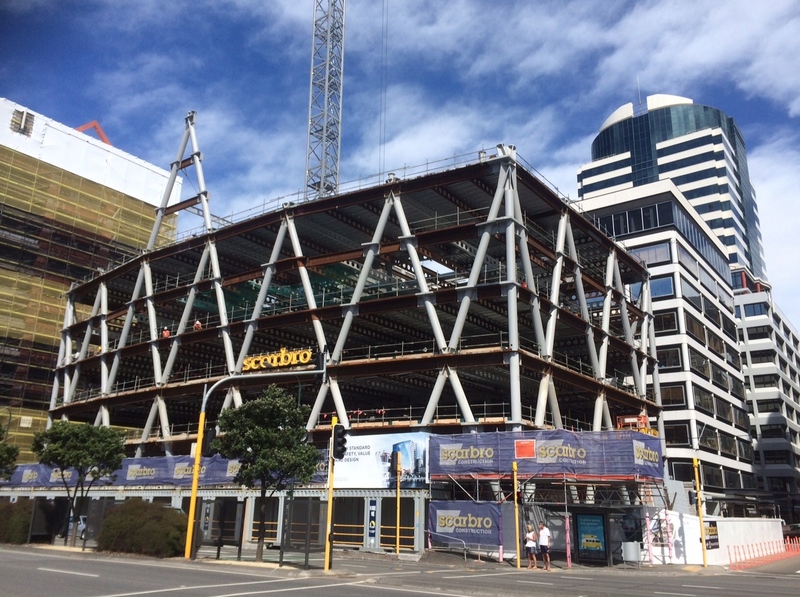 The project is definitely visually very different from any other building in Wellington. It is externally supported by a diagrid of criss-crossed steel tubes, and these sit on a perimeter of base isolated foundations. Diagrids are cool – inherently much stronger than a more straightforward orthogonal grid, and consequently much lighter in terms of tonnes of steel used – there’s a saving of something like 20% of the steel used. The other prominent diagrid tower building I know of is the Hearst tower in New York, built a few years ago by Foster and Partners. We covered that similarity in a couple of previous posts on this site, here and also here. Architects are Studio Pacific and Engineers are Dunning Thornton. 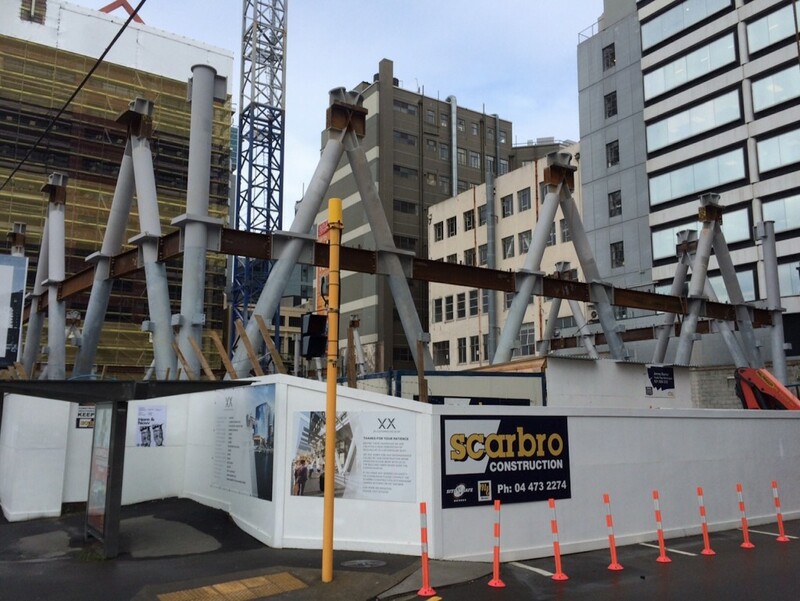 Contractors are Scarbro, an Auckland contractor – at least, I haven’t noticed them in Wellington before. 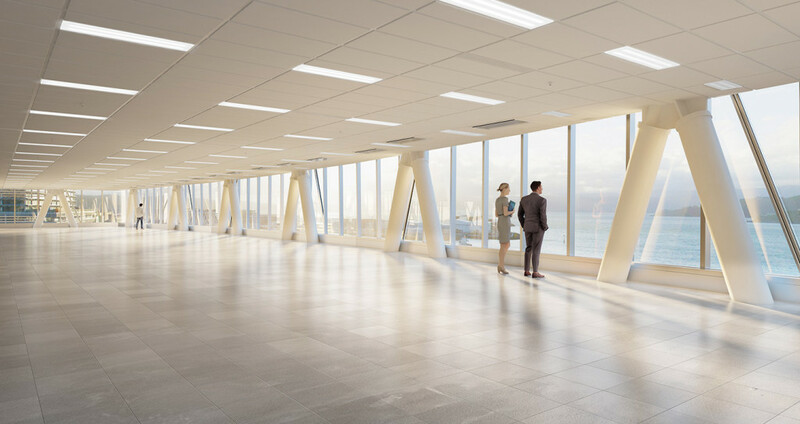 The Developer is Newcrest, the developer of the Vodafone building and NZI centre in Auckland (built by Scarbro for Newcrest), and the redevelopment of Shed 22 in Wellington a decade or more ago. This building looks like it will be Newcrest’s flagship development, certainly one in which they will be very proud. 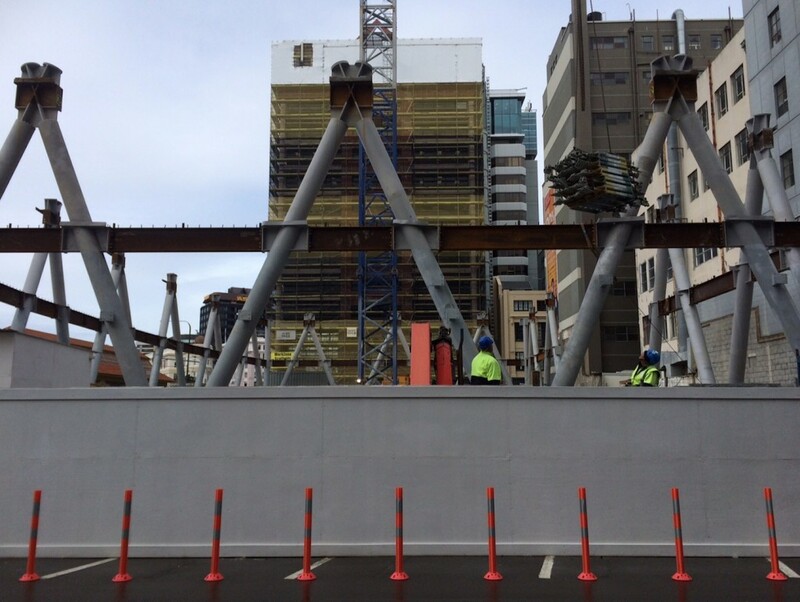 The steelwork rolls in to XXCQ daily, with each giant row of X going up 3 floors at a time. This must lead to some interesting welding in the factory (Steelwork fabrication by MJH in the Hutt, or so the guys on site tell me) where it is being superbly stitched together, and I guess that the diagonal nature means that every time it clicks together, you know it is rigid and in the right place – you can’t lie with a triangle! Millimetre perfect? Is there a BIM model in play? Is the architect’s steel model the same as the engineers? And are they both the same as the one that MJH is working from? You’d have to hope so – there is no room for errors here. Super stiff!! The downside of a diagrid, if there is one, is that you have structural elements go racing past your window on an angle, but that actually makes the view more exciting rather than less. The NZI Centre in Auckland is a mini version of a diagrid I suppose, but I think this is the first time we have seen this technology on such a scale. Once the 3-story high perimeter is in, the floors are installed (i.e. steel decking and concrete laid), top floor first, and then the two lower floors. 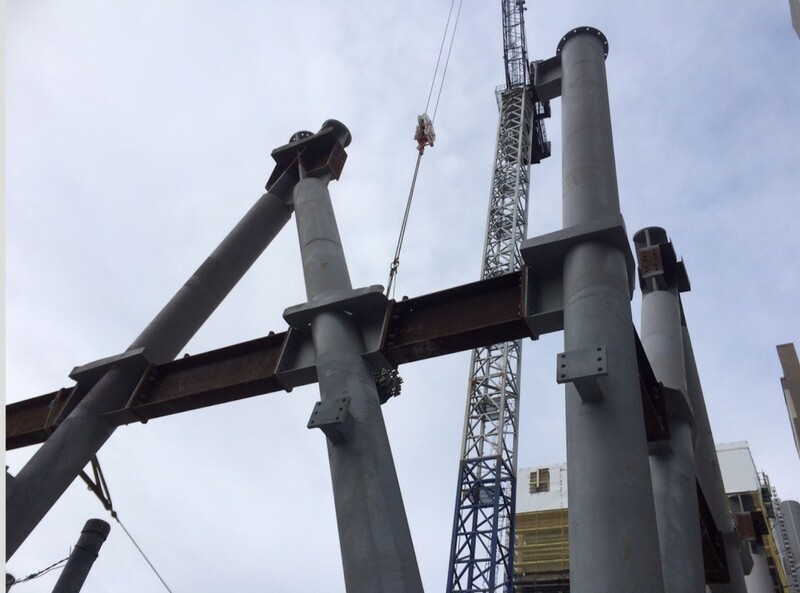 All the beams are on site with large numbers of holes already punched through, for maximum services flexibility as well as a saving in the weight of the steel used. Altogether, it’s such a clever building – we should do this more, and I’m guessing that from now on, we certainly will. Glazing this structure is going to be interesting as well, and now that they are up to about level 9, the glazing probably isn’t far behind. First sheet of glass is up, south side. Thanks for that Gary and Greenwelly. It’s funny – I only just realised that although Parliament has got Base Isolation, I’ve never seen any sign of it. Must be well hidden! Thanks 60 – I’ve not heard about that, but yes, it does make sense that – the only place they could jack the building is at the base isolator level. And yes, we should be able to see those, eventually, in the basement. Several sheets of glass installed already. Very large sheets ! !